"Three Cheers for the Red, White and Blue!" I just love the 4th of July holiday! I am a very patriotic gal and love any chance to celebrate our wonderful country and the FREEDOM it represents! Today and tomorrow my posts will be USA - all the way. For this week's Blogger's Challenge, we were to create a Patriotic Themed card. Well, the only 4th of July stamps I own are "gasp" not Stampin' Up! so I put my little pea brain to work to see what I could come up with using just the SU! stamps I do have. As you can see, this card is pretty straightforward stamping. I did stamp off the red fireworks 3 times before stamping on the greeting. Real Red is a pretty intense color. The glitter edge on the greeting was made by running my 2 Way Glue Pen all around the edges and then dragging it through a tray of Dazzling Diamonds - boy doesn't that sound fun! If only they were real! The two Rhinestone Brads are attached through 2 layers so the prongs don't show through the top layer when folded flat. All these products and more can be ordered from my website 24/7 at www.robinstamps4u.stampinup.net Just click on the SHOP NOW button at the top right corner. Be sure to check out all the other Patriotic Inspiration from the talented Blogger's Challenge players by clicking on the link on my sidebar. Then be sure to come back tomorrow for this week's Stamping 411 Sketch Challenge card! Thanks for stopping by today and have a great All-American weekend! OMG! The minute I saw the card I thought "brilliant blue". It makes a lovely card. I like this one. Happy 4th! This is great! I've always loved these stamps -- they work great for fireworks! Love the glittered edge on your sentiment panel! Very cute! Love the stamps that look like fireworks and must have missed this boat! Very creative use of the flowers for fireworks! This is a perfect use of these stamps -- who knew?! Great job, my friend and Happy 4th to ya! Great card, I love those "fireworks". 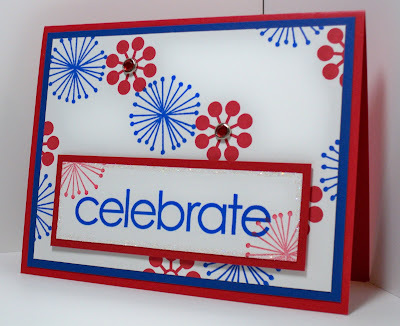 I ALMOST used that same flower stamp for a card...I thought it would make great fireworks...and it does! Great job, Robin! This looks great, Robin! Great idea for the fireworks! Great job with this card. The colors are fabulous (yes I love BB) and the stamps are perfect for bursting fireworks. What a cute card! Great job! Great card for the challenge! Love how festive it is! Such a smart choice of stamps! Super job!!! Happy 4th! I'm so proud of you for using Brilliant Blue. This card is adorable...they really do look like fireworks!! Like you, I rarely use Brilliant Blue.....but it works perfectly on this card! Simple, but stunning! Gotta love that! OMG!!! What an awesome card and I sooooo heart Brilliant Blue!!! !